We are Manufacturer, Supplier & Exporter of Soil Conditioners and our setup is situated in Nashik, Maharashtra, India. Secondary Nutrient Mixture Calcium (Ca), Magnesium (Mg), Sulphur (S) Soil conditioner enriched with Secondary Nutrients such as Calcium (Ca) - 8% Magnesium (Mg) - 8% and Sulphur (S) - 6% The soil strata has been unbalanced due to the extreme usage of chemical fertilizers containing only N,P and K. Farmers hardly make use of secondary and micro nutrients as fertilizers . This results in stunted growth and poor yields of crop as well as poor soil condition. 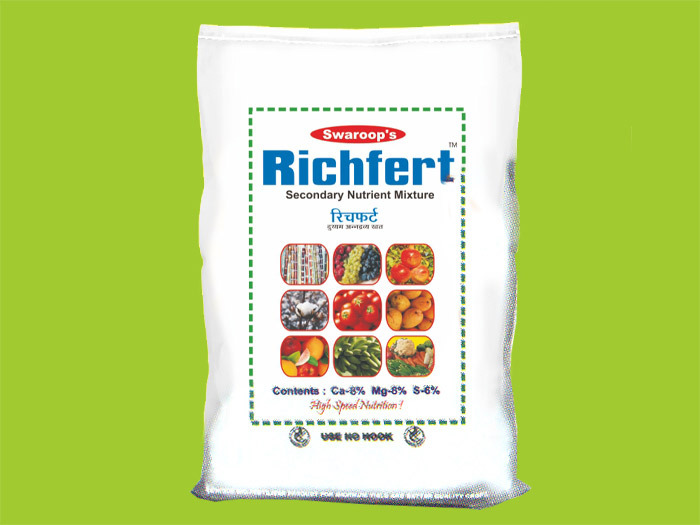 Richfert contains secondary nutrients Nutrients such as Calcium (Ca) , Magnesium (Mg) and Sulphur (S) . Due to the presence of these elements, it acts as SOIL CONDITIONER. Because it improves the soil strata by improving the soil structure, ion exchange capacity as well as regulates the pH. Use of RICHFERT gives more number of flowers and fruits. Crops become healthy and there is overall increase in yields.